Both in Greece in 2012 and Italy in 2013, it took two elections to form a government. A repeat parliamentary contest was required in Greece and the unprecedented re-election of the outgoing President of the Republic in Italy before a cabinet could be formed. Against a background of economic crisis and national austerity, both countries experienced ‘protest elections’ in which the overriding concern for an unusually large proportion of voters was not to choose a government but to express dissent. The outcome included record-breaking electoral volatility, the decline of bipolarism, the startling rise of challenger parties and the transformation of national patterns of government formation, including experiments with grand coalitions and technocrat-led cabinets. These developments sent shock waves through Europe and beyond, suggesting Southern Europe might be drifting towards ungovernability. The volume offers analyses of the key electoral contests at the parliamentary, presidential and local government levels, complemented by special studies of two key challenger parties, Beppe Grillo’s Five Star Movement in Italy and Golden Dawn in Greece. 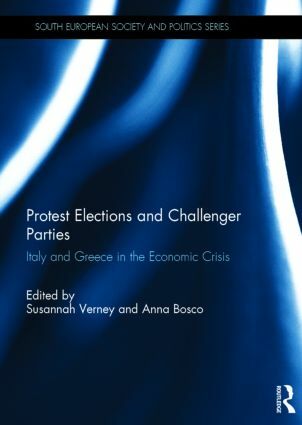 An introductory comparative overview traces the process of convergence between the political systems of Italy and Greece which appears to have been triggered by the economic crisis. This book was published as a special issue of South European Society and Politics. Susannah Verney, Assistant Professor of European Integration, University of Athens. Anna Bosco, Associate Professor of Comparative Politics, University of Trieste. The parallel regime transitions of the 1970s, when Southern Europe was the vanguard of the ‘third wave’ of democratisation, the impact of EU membership and Europeanisation and more recently, the region’s central role in the eurozone crisis have all made Southern Europe a distinctive area of interest for social science scholars. The South European Society and Politics book series promotes new empirical research into the domestic politics and society of South European states. The series, open to a broad range of social science approaches, offers comparative thematic volumes covering the region as a whole and on occasion, innovative single-country studies. Its geographical scope includes both ‘old’ and ‘new’ Southern Europe, defined as Italy, Greece, Portugal, Spain, Cyprus, Malta and Turkey.